First of all i want to clear a misunderstanding.....that is i am not publishing this article to annoy Pakistani users or it doesn't mean that i hates Pakistan. I love both countries and know that these both are fighting with corruption and other problems. So its inform to all my readers that this article is only for your knowledge purpose and i am publishing it to protect your personal computer from being hacked by Hackers. Recently a News article in rediff.com, reported that Home ministry sources said that Pakistani Hackers are creating websites to access personal information of other users. The Songs.pk is one of them. We all are known to this site. Most of us are using this site to download all music content. This site offers Latest Bollywood Tracks, Indian Gazzals etc. The 80% of total traffic of Songs.pk is Indians. Indian users are using this site and downloading content from this site at daily basis. If you are one of them ,then it is time to move further and to make some changes to be safe on internet. 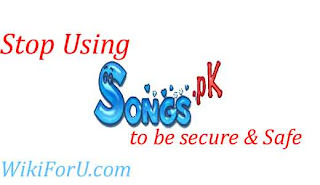 Sources said Songs.pk Website is hosted and maintained by a Hacker from Pakistan. They further said that this type of sites often send viruses to our computer via Downloads and thus make our computer at risk. From a report, it is cleared that over 12 lakh people or internet users of India are using this site on daily basis. Thus one day that hacker may control over 12 lakh computers and can damage our network. According to sources, This type of sites contain virus files and vulnerable content that is newly created by those hackers and thus our antivirus software can't understand that this is a virus or not and filter that file as a simple file. But in reality that is a potential Virus that can affect our whole computer and can control our Computer. So this is my humble request to all internet users(Not only Indians) that they must stop using Songs.pk if they want to be safe and respect other's privacy.